Who is Trump considering to replace Rex Tillerson? The White House has drafted and is circulating a plan for the exit of Secretary of State Rex Tillerson, CBS News confirms. The plan is for Tillerson, who has been on the job for less than a year, to be replaced by the current CIA director, Mike Pompeo. Several sources tell CBS News that White House chief of staff John Kelly has signed off on the plan, Major Garrett reports. It has been circulating for some time, but Kelly's approval indicates that it's reached a high level in the approval process. The White House has not yet decided who would replace Pompeo, but names under consideration include Sen. Tom Cotton, R-Arkansas, and Robert Harward, former deputy commander of U.S. Central Command. The CIA has no comment on this report. Cotton is trusted by the president and has advised Mr. Trump on foreign policy issues, as he has sought to take a tougher stance on Iran and make changes to the current Iran Deal, an agreement that Cotton has consistently opposed. Kelly has also spoken with Cotton, CBS News' Jenna Gibson reports, according to a GOP source familiar with the matter. Cotton has made it clear, Garrett reports, that he would take the CIA job if it's offered, and the Arkansas senator is by far Mr. Trump's favorite prospect for the post. Cotton is widely believed to be interested in seeking higher office in the future. But his communications director, Caroline Rabbitt Tabler, told CBS News that Cotton's focus "is on serving Arkansans in the Senate." The New York Times first reported that the White House plans to force Tillerson out. Harward, a 60-year-old former Navy SEAL, was offered the job of national security adviser earlier this year. He turned it down, citing "financial and family issues" that he had to take time to resolve. He is currently the chief executive for Lockheed Martin's United Arab Emirates division. Harward served under now-Defense Secretary James Mattis when he was the deputy commander of U.S. Central Command. Mattis continues to have a close working relationship with the White House. At this point, the White House does not acknowledge that Tillerson's tenure is coming to an end any time soon -- the president, asked Thursday whether he wants Tillerson on the job, replied, "He's here. Rex is here," which was also not exactly a denial that his time with the administration may be short. White House press secretary Sarah Huckabee Sanders referred to the president's remarks and told reporters, "There are no personnel announcements at this time." This comes after a bitter few months between Tillerson and Mr. Trump during which the president has repeatedly undermined America's chief diplomat. Trump tweeted that Tillerson was wasting his time with North Korea. In October, Tillerson shot down a report that said he had been on the verge of resigning from his Cabinet position over the summer. "I have never considered leaving this post," Tillerson said about what he called an "erroneously" reported story from NBC News. NBC also reported that Tillerson had called President Trump a "moron." Asked to respond to that part of the story, the secretary of state replied, "I'm not going to deal with petty stuff like that," though he did not deny making the comment. 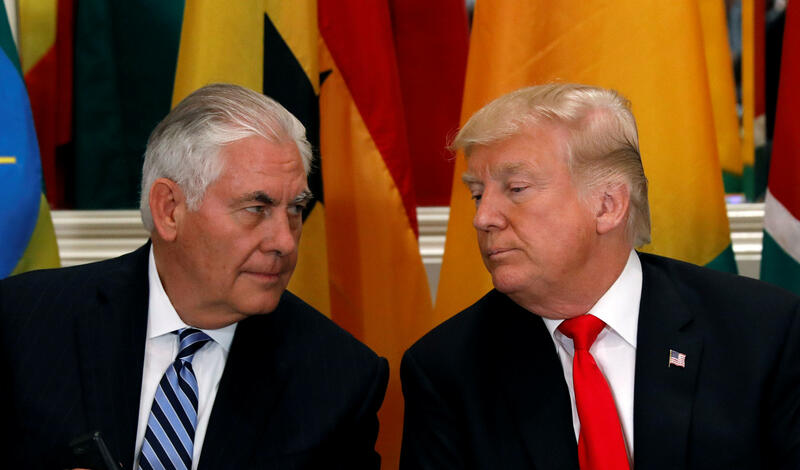 A few days after the story was published, Mr. Trump attacked Tillerson in an interview with Forbes magazine, suggesting that he's smarter than the secretary. The president was reacting to the report that said Tillerson called him a moron. "I think it's fake news, but if he did that, I guess we'll have to compare IQ tests. And I can tell you who is going to win," Mr. Trump told Forbes. The Senate confirmed Tillerson, 65, as secretary of state in early February. He had previously been the CEO of ExxonMobil. Tillerson has come under fire on a number of fronts throughout his tenure to this point. He has not filled top leadership positions at the State Department and congress is weary about his plan to restructure of the State Department. Congress says they have yet to see the details of that plan. Despite advocating for a White House budget that would cut the State Department funding by 30 percent earlier this week, Tillerson denied reports suggesting that he is gutting the State Department. "There is no hollowing out," Tillerson said during remarks at the Woodrow Wilson International Center earlier this week. He rejected the numbers that have been reported and noted that a story about a 60-percent reduction in career diplomats was a decrease from six to two career diplomats. "It sounded like the sky was falling," he said. Tillerson also took a moment to defend those in acting leadership at the department, who have stepped in to fill roles where the administration has not tapped leadership. "I read these articles that there's this hollowing out, I take offense to that on their behalf because the people that are serving in those roles are doing extraordinary work, and they know they're not going to get the job permanently," Tillerson said. Tillerson also blamed the slow filling of the top State Department vacancies, in part, on Congress. He lamented that the confirmation process "has been excruciatingly slow" for many nominees. But the Senate is pushing back on that characterization and growing more frustrated with Tillerson. About half of the top Senate-confirmed positions at State and USAID – 85 positions – do not have a nominee, according to the Senate Foreign Relations committee. Of those, the Senate has confirmed 56 nominees to the State Department and USAID. And as of this week, seven nominees are pending action in the full Senate, and 15 nominees are in various stages of the Senate Foreign Relations nominating process. CBS News' Jacqueline Alemany, Margaret Brennan, Major Garrett, Rebecca Shabad, Jenna Gibson and Andres Triay contributed to this story.